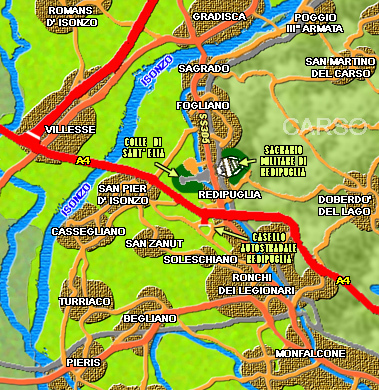 Ristorante Redipuglia - Where are we ? The military monumental Sacrarium of Redipuglia lies on a hill nearby the main road 305 between Redipuglia and Fogliano, less than 1 mile from the Highway gate "Redipuglia". The Restaurant Redipuglia is located right inside the sacred area, at the feet of the Sacrarium and the Sant Eliah Hill. 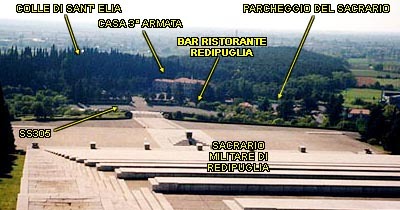 The restaurant is at the ground floor of 3rd Armata House, the only building within the sacred area, where the historical museum is located too. We are a few meters from the big parking place where several cars and vans can find place.